Avoiding Overflowing Inbox Anxiety | welcome to the janniverse. I’ll say this right up front: this is an area in which I could really (really, really, really) stand to improve. Also, I think the wonder and terror of Gmail aids and abets my lazy email habits. Yes, I know Gmail has several wonderful tools for organization. Yes, I know this is still largely my fault. But I also think you’ll understand what I mean if I explain. It started a very long time ago, back when I first had access to email. Of course there were things I wanted to be able to read again. I liked being clever; still do, in fact. I like it when my friends are clever. I like it when I learn things. So it’s only natural that I couldn’t find it in my heart to delete these emails. Then it became part of my job. I had a different email account for work, sure. But I started to need to hold onto email as part of my job. The email system we used didn’t have nicely threaded conversations the way Gmail does, so most email conversations simply quoted relevant text from one message to the next. We printed emails out (yeah, I know) to keep with relevant documentation. Those in my department dreamed of the day that we’d change our procedures enough to simply rely on a database (or two) to keep all our information organized, so we could stop printing out every single thing ever. Still, we continued to do it because it was what we did. 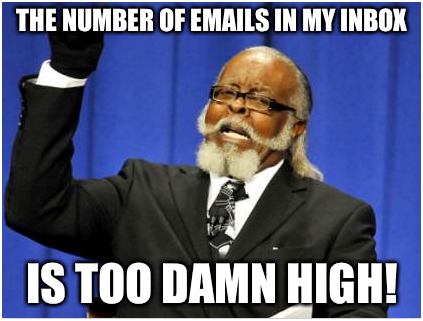 Like most people I know, I have a handful of email accounts that I use for different things. I’m pretty good about deleting any spam that gets through my filters right away. I’m also pretty good about opening and responding to important stuff right away. Receipts for purchases or other important stuff that requires no response, I’m quite good at filing away in a folder, should I need it for the future. What I’m less good at is handling the stuff that falls into that nebulous space in between. I sign up for emails from publications or stores that I like, for example. Sometimes I feel like reading them. Other times, I feel like I don’t have enough time, and would feel guilty if I took any time away from my to-do list to read them since they’re not that important. Do I delete them when I feel like the latter is the case? I should. I know I should just delete them. It’s not like I’ll never get another email from those places again. But for some reason, I don’t. I also don’t delete work-related conversations, because I never know when I’ll need to refer back to them again. I’ve had them come in handy several times before. If you freelance, it’s essential to hang onto client correspondence about everything, because you never know when you’ll need to re-read it, or to refresh your client’s memory about something you’ve already discussed. That’s the problem. I haven’t. I am terrible at organizing my email. And I really, really need to get better. The few things for which I have folders are a good start. Or they would be — if I’d actually go through those folders and delete outdated and irrelevant things once in awhile. Do I really need receipts for online purchases from 6 years ago? I mean, I’ve probably a) received the item(s), and b) can’t possibly expect to return or exchange them after 6 years…right? Those work-related conversations I mentioned above? I haven’t previously put those work-related conversations in folders. Instead, they just sit in my inbox, adding to the clutter and growing sense of impending doom. Then I use the search function if I ever need to pull up some arcane bit of information from them in the future. Pretty lame, I know. I know what I need to do. I need to go through my inboxes, delete everything that’s too old to matter or is otherwise unimportant, and sanely organize the rest. The other problem I have is this: I’m a completist. That is, I like to stay doggedly in single-task-mode until I’ve completed a task. I don’t like distractions, unless I hit some sort of wall and actually find myself needing to take a break. I’d rather just plow through, regardless of time spent (or clock-time, or dinnertime). When I’m really lost in a task, I probably would have no concept of time at all if I didn’t have a little clock in the lower right corner of my screen — well, that and how much sunlight is coming through the window of my office. That’s why I love my particular to-do list app; it helps me break down onerously huge tasks into much more manageable bite-sized ones. My email, well — I’ve let it get so far out of control that it’s much more of a challenge than it should be. What’s your favorite way to rein in your inboxes? For myself, once I get this mess back in order, I think I’ll try to maintain a strict policy of shunting those nebulous emails into a folder if I don’t want to look at them right away. Once a week, I’ll go through that folder and review what’s there, either looking at or deleting as needed.